Pla del Mar is the "top spot" in Moraira. Peaceful yet close to Town. Los Limoneros is a small residential complex of 18 bungalows surrounding the community swimming pool and gardens. It is less than 1 km from Moraira village and the beach with many bars and restaurants. The Los Limoneros community is very friendly and ideal for families with children, Septimo Siete is a terraced bungalow with two bedrooms; one double and one with two single beds. The windows have shutters and mosquito nets. The bathroom has a WC, sink and shower. The lounge-dining room opens on to the patio (with table and chairs) with direct access to the gardens and pool. The open plan kitchen is fully equipped with washing machine, washing up machine, fridge-freezer, wine cooler, microwave, kettle, toaster and electric oven and cooker. There is currently air conditioning/heating only in the twin bedroom (yet to be fitted in the double bedroom), use of which is included in the price. Situated within easy walking distance of Moraira, this is a great base from which to see the delights of Moraira - on foot or with a car. There is parking at the rear of the property and as, a general rule, car hire is cheaper than taking a taxi from Alicante airport. I have been coming to Moraira since 1963 and know this part of Town very well having owned a villa nearby since 1986. It is the best place to be. Location, location, location. Everything is there or nearby; a short wall to Town, the shops, bars ,restaurants, supermarkets & the beach. The bathroom has a WC, sink set in a vanity unit with lit mirror over, shower and heater. Only partial as yet - in the twin bedroom. Partial air con heats and cools, supplemented by electric movable radiators and wood burning fire. Modern kitchen with fridge-freezer, washing machine, dishwasher, microwave, hob and oven and all the usual appliances, cutlery, crockery, glasses etc. 2 dining areas; inside or outside! TV channels available in English, Dutch, German,French, Norwegian & Russian. A few of the good old standards! Front terrace / patio faces South towards the pool. Equipped with table and chairs. Lovely pool right outside. Do watch out for non swimmers. Los Limoneros is a small group of 18 linked villas set around a central garden and large swimming pool adjacent to the Los Limoneros Hotel in Pla del Mar, Moraira. It is a short walk from the centre of Moraira with all its shops, bars, restaurants and the beach. Within metres of the pool, we offer a 2 bedroom villa all on one level with fully fitted kitchen, new bathroom and living room. The front patio opens out directly onto the gardens and pool. The apartment has partial hot and cold air conditioning. Wifi and TV both available. This property is very well situated for the town centre, it's about a 10 minute walk, some of it uphill on the way back. A few minutes in the car will get to Pepe el Sal supermarket. Family who have property in Moraira commented that our location was one of the best and this was unsolicited. The hotel next door is lovely, with a gorgeous outlook, generous ice-cream and pizza! The property itself is in a great position next to the fantastic swimming pool, and has sun for most of the day and quite a bit of the evening. The condition is not as good as others nearby, it's in need of a bit of TLC. However, the beds were very comfortable, the shower worked well, and the kitchen was well stocked, apart from having no spare bags for the bin, or any other tea-towels. Some of the electrics were an eyesore, and the TV was very hit and miss. It would be nice to have some air-conditioning in the 2nd bedroom and the patio could do with some parasols. The ones supplied were inadequate. Unfortunately for us, there was some work immediately next door, with a builder laying new tiles. He arrived at 7.50 am and started work, shortly followed with his power tools. After the 3rd morning, we contacted John and he immediately responded and acted to resolve the problem, which was very much appreciated. Overall, this property served our purposes and we would recommend and stay here again. Thank you very much John and Karen. Due to unforeseen circumstances, I needed to book accommodation at very short notice. The owner and his local agents couldn't have been more helpful - many thanks for that! The development and the communal areas are very well maintained. This property gets the sun for most of the day in winter, which is when we stayed. It is certainly in a prime location and an easy walk into the town for shops, restaurants and so on. The accommodation itself is comfortable and has a good range of fittings, utensils and so on. Whether you've stayed in Moraira before or not, this is a great place for a relaxed holiday! My aim as Owner is to try to do the best I can for everyone who comes to stay at Puesta. In this instance, I was very happy to be able to help out at short notice and am delighted that the result was so good for all concerned. Lovely family villa, ideally situated for beach, shops & restaurants. We are a family of 4 with children 10 & 12 and visited end August / beginning of September 2017. Internally the bungalow was more modern than many on the complex with a good spec shower room & well equipped granite topped kitchen. The removal of its original archway gave the living area an airy feel. The owner, John Pickles, was an absolute legend and went out of his way to help us during our stay. Thank you John. Los Limoneros area of Moraira is an ideal base for your holiday in this region. Easy to walk to Moraira & it's beaches & a pleasant 2km walk to El Portet. I feel Moraira, as a resort, is bustling enough without becoming tacky and has an air of quality about it. There are lovely eateries and during our 2 week stay we travelled the world in 80 restaurants! We didn't hire a car and used Beniconnect to transfer to & from the airport. Though there was parking behind the bungalow which made visiting the region easily accessible. Couldn't recommend the bungalow and it's location highly enough. Moraira (El Portet and Pla de Mar in particular) is the part of the world that I have known and loved since I was a child; so happy that you loved it too. Very pleased that you enjoyed it. Come again! John ensured that everything was organised for our arrival and we were so pleased with the choice to stay there. The bungalow is situated in a gorgeous part of Moraira, a 10 minute stroll into town. Amazing local restaurants, golden beaches and the Harbour, choosing a different restaurant every evening. 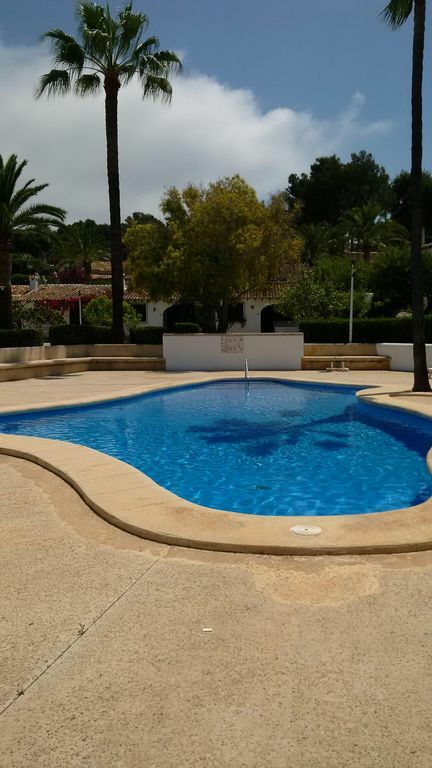 We would definitely recommend this bungalow to anyone looking to stay in Moraira. It was a little piece of heaven. We chose the villa primarily on location; the short walk to Town is true - not a long way to go - and Moraira is the best village on the Costa Blanca. I have been visiting since 1963 and so I know that location counts! This is in the best place for peace in good surroundings, yet close to the liveliness of Moraira.